Karnataka Verdict: SC has refused to stay the oath-taking ceremony of BJP Legislative Party chief BS Yeddyurappa. Karnataka Government Formation LIVE: With less than five hours in the oath-taking ceremony, BS Yeddyurappa finally won the uphill battle till the CM office, in ballot and in court. After an extensive overnight courtroom drama, a three-judge Supreme Court bench gave BJP Legislative Party chief Yeddyurappa go ahead to take oath at the scheduled ceremony at 9 am. Supreme Court did not dismiss the petition filed by Congress and JD(S), said, "this petition is a subject of hearing later on". SC also issued a notice to respondents including BJP's BS Yeddyurappa, asking to file a reply, In a late night petition, Congress and JD(S) had argued that the Governor's decision to invite BJP to form the government in Karnataka should be treated as unconstitutional because their alliance had the majority seats. But Congress lawyer Abhishek Manu Singhvi failed to produce the letter of support by 117 MLAs when asked by the court. At midnight, the poll battle of Karnataka reached Delhi. In a high-voltage drama, the fate of the state assembly shifted to the hands of Supreme Court as Congress party filed a request for an urgent hearing against Karnataka Governor Vajubhai Vala's decision to invite BS Yeddyurappa to form the government in the state. At around 1:15 am, the apex court admitted Congress and JD(S)'s plea. The hearing is set for 01:45 am and will be held by a three-judge bench. After a day of hectic politics, both BJP led by BS Yeddyurappa and Congress-JD(S) led by HD Kumaraswamy had presented their case to Governor, who had promised to make an unbiased decision on the basis of Constitution, SC judgment, and precedence in Goa and Manipur. 04:23 am: With less than 5 hours to go in oath taking ceremony, the Supreme Court on Thursday dismissed the Congress' allegations that Governor's decision to invite BJP's BS Yeddyurappa was 'unconstitutional'. 02:31 am: Two main issues in front of the court - 1) Will Yeddyurappa take oath at 9 am today, 2) Will BJP get 15 days to prove majority in the assembly or less? 01:40 am: Ironically, Abhishek Manu Singhvi today thanked CJI for midnight hearing while his party Congress tried to impeach him less than a fortnight ago. 01:10 am: Irrespective of merits, very gracious of SC to fix hearing at 145 pm at ct no 2. Shows justice never sleeps & accessibility is 24x7, where merits so demand. Which apex court in world allows such accessibility? 00:43 am: Legal experts say that the aim of Congress party is not to postpone or cancel tomorrow's oath but reduce the time period given to Yeddyurappa to prove his majority in the House. 00:34 am: The registrar has asked for a list of advocates who will appear before the CJI. The decision on Congress' petition likely any minute now. -Apparently BSY is not as attached 2astrology as 2his coveted CM post. Initially, he had proclaimed 1230 pm as astrologically propitious 4swearing in. Now it seems that cong jds threat of sc legal action led him 2prepone swearing in to 930! Remember courts normally sit at1030 am. -Ever heard of 15days 2prove majority 2 a 104 MLA strength party when opposers gave lists totalling 116! Sc reduced floor test duration in Jagdambika pal UP case; anil jha Jharkhand case & kevalker Goa case from 7days to 48 hrs in each case. No reason for SC 2differ this time. -Governor cld not have given written permission & license 4poaching more effectively than by this letter inviting BSY’s minority & then giving them 15days 2show majority. Elementary common sense tells all that no one with 104 can cross 112 wo massive horse trading. -This is interesting ! BSY had asked for seven days time to prove majority. Governor gives him fifteen days!This by itself is enuff to prove discarding of all constitutional Norms & acting virtually as a partisan agent of the central Govt nt a ctal functionary. 11:00 pm: Police security increased on Krishna Menon Road in Delhi. CJI Dipak Misra lives on the road. 10:51 pm: Citing 'Constitutional violation', Congress files an affidavit in SC for urgent hearing against Guv's decision to invite Yeddyurappa to form govt, approaches CJI Dipak Misra for an overnight hearing. 09:44 am: The Governor based the decision on the SC judgement in 2005, wherein Shibu Soren was allowed to form govt and prove majority within 19 days. Soren failed after SC took a stern view against Governor's decision and asked him to prove his majority within a day. 09:25 pm: BJP retweets its deleted tweet. 08:32 pm: Governor has reportedly given one week to Yeddyurappa government to prove its majority in the House. Congress likely to keep its MLAs hidden in a resort for the duration. 08:31 pm: However, there has been no confirmation on this from Raj Bhawan. 08:30 pm: Putting an end to speculations, Karnataka Governor Vajubhai Vala has reportedly invited BJP legislative party chief BS Yedyurappa to form the government in the state. BJP had emerged as the single largest party in Karnataka Assembly Election Results 2018 announced yesterday by winning polls in 104 constituencies in a 224 seat assembly. The decision is likely to irk the Congress-JD(S) alliance which has threatened to knock the doors of Supreme Court and stage a protest outside Raj Bhawan if they are not invited to form the government. 06:34 pm: Priyanka Chaturvedi, Congress to India TV: A govt made on the basis of such tactics can never survive. If it comes to power Yeddyurappa govt will fall within 5 days just like Atal Bihari Vajpayee govt fell within 13 days. 05:59 pm: Congress leader G Parameshwara from party office: We have submitted the letter to the Governor with a support of 117 people and have cited recent SC order to assert our case. We have also cited Goa and Manipur examples, we have asked him to take these cases into account. 05:37 pm: Congress and JDS' meeting with Governor ends. The alliance says Governor has assured them of the due Constitutional process, he has assured us that he will look at the precedence before making the decision, the alliance said at a press conference after the meeting. 03:44 pm: JD(S) and Congress to meet Karnataka Governor Vajubhai Vala at 5 pm. 03:36 pm: Sources say, JD(S) chief HD Kumaraswamy is currently holding a meeting with his party workers at Hotel Shangrila. 02:24 pm: Karnataka Pradesh Congress Committee (KPCC) President Dr G. Parameshwara elected as Congress legislature party leader. 01:05 pm: This is a bogus news. No Javadekar, no BJP leader has met me till now: HD Kumaraswamy, on being asked if he had met BJP Karnataka in-charge Prakash Javadekar. 11:44 am: According to India TV sources, BJP MLAs meeting discussed that 10 MLAs from rival camp are ready to support BJP. Kumaraswamy will resign from one seat, so party will have to claim majority for 221 seats only, the sources added. 11:41 am: 66 out of the 78 MLAs reached for Congress legislative meeting at Karnataka Party Congress Committee office in Bengaluru. 11:31 am: According to India TV sources, B S Yeddyurappa may take oath at 11:30 am tomorrow. 11:18 am: BS Yeddyurappa has reached the Governor’s House to stake claim on government formation in Karnataka. He is likely to seek time from Governor Vajubhai Vala, and said that he will take oath tomorrow. 11:15 am: Senior Karnataka BJP leader KS Eshwarappa says that their party is in touch with some Congress and Janata Dal (Secular) MLAs as they hope to stitch together a majority to form the government in the state. 11:07 am: JD(S)' MLAs Raja Venkatappa Nayaka and Venkata Rao Nadagouda are missing from the JD(S) legislative party meeting which is going on in a hotel in Bengaluru. 11:03 am: Ahead of JD(S) party meeting, Kumaraswamy met BJP's Yeddyurappa, Prakash Javadekar and Ananth Kumar in Bengaluru. Is a new turnaround on cards? 10:38 am: According to India TV sources, JD(S) President Kumaraswamy met BJP ministers, and said that he will not disclose about the meeting but all MLAs are with him. 10:24 am: According to sources, 45 Congress MLAs have reached Bengaluru for the party meeting. Two flights have been sent -- one to Badami and the other to Belagavi -- to bring the remaining MLAs. The JD(S)-Congress combine is reportedly also planning to parade its 116 MLAs before the Governor today. 10:15 am: The BJP might look into the option of getting MLAs from the rival camp to shift their loyalty or absent themselves, while it proves majority on the floor. This would bring down the mark required for a simple majority. 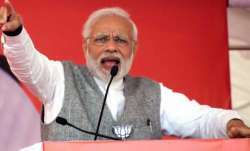 10:04 am: The micro-blogging platform registered over 30 lakh tweets related to Karnataka assembly polls in the past three weeks, with the Bharatiya Janata Party (BJP) garnering 51 per cent of the share of voice, Twitter announced on Wednesday. 09:41 am: Bharatiya Janata Party national Vice President Vinay Sahasrabuddhe says that he is confident that Karnataka Governor Vajubhai Vala will respect the party's position as the single largest one and invite it to form the government. 09:28 am: JD(S) & Congress have the numbers. I hope, the governor will discharge his constitutional duties & invite HD Kumaraswamy to talk. If BJP puts pressure on the governor, it will be the death of Democracy: Danish Ali, JD(S). 09:16 am: All the Congress MLAs are intact. Nobody is missing. We are confident of forming the government: Siddaramaiah, Congress after reaching the Karnataka Pradesh Congress Committee (KPCC) office for party legislative meeting. 08:31 am: BJP legislative party meeting likely at 10:30 am. Following the meet, all party MLAs led by Yeddyurappa to approach Governor to request him to allow the party to prove majority. 08:14 am: The JD(S), which is likely to likely to send its MLAs to a resort in Kochi, will first hold a crucial meeting of its leaders in Bengaluru’s Le Mediridian Hotel at 09:30 am today to elect Kumaraswamy as the leader of the legislature party. 08:05 am: According to sources, Congress may zero in on G Parmeshwara's name as deputy CM after a meeting today. 08:00 am: BJP, in its bid to form a government in the southern state, dispatched central ministers Prakash Javadekar, Dharmendra Pradhan and J P Nadda to Bengaluru to consult CM-nominee B S Yeddyurappa and other state leaders on the possible options. The three will attend a meeting of the newly-elected BJP MLAs in Bengaluru on Wednesday as the party's central observers. 07:55 am: The BJP and JD(S) are expected to reapproach the Governor today to stake claim to form the next government in the state.